In a killer interview freshly published today on the amazing Spannered blog, Rephlex co-founder Grant Wilson-Claridge (a.k.a. DJ Rephlex Records) announces that they will be adding some new (still top secret) artists to the roster in the album's 20th year, as well as releasing Monolith's debut full-length, and more incredible music from Wisp, Aleksi Perala, Jodey Kendrick, D'Arcangelo, and others. "Really importantly and imminently, Dave Monolith debut album. Outstanding. And more Wisp. Those two guys are hugely underrated or unknown by too many so do check 'em out and help us promote them, so the world becomes a better place. I have seen their music leave people crying, smiling, jumping every time everywhere. I also have the dopest album by Aleksi Perälä which is mental sub bass and pure harmonics like mother nature’s dub. A shedload of absolutely top quality lush dance tunes from Jodey Kendrick (keeping the hot core of acid house, Detroit techno and braindance burning), deep electronics from the D’Arcangelo brothers, the mysterious Steinvord and an audio-visual project from one of my favourite artists, Pierre Bastien. There are a couple of other new people in the schedule too but more info about them later..."
We also know from recent press releases that the first 3 products coming out on the Rephlex conveyor belt in 2011 are: 1.) electro-funk superstar Dwayne Omarr's "Multi Funk", a collective re-issue of 80's singles and new tunes due out Jan. 18th; 2.) "The Criminal Minds" a collage of gritty hip-hop by britcore outfit T.C.M. out Feb. 1st; and 3.) "Paranormale Aktivitat" by Zwischenwelt, an eerie, otherworldly electronic study of the paranormal out Feb. 21st by collaborative group composed of former Drexciya member Heinrich Mueller (a.k.a. Gerald Donald), New York DJ/producer Susana Correia, Spanish producer Penelope Lopez and vocalist Beta Evers (who operates a number of German labels, including Kommando 6). This variety right off the bat is exactly what the label needed to mix things up before a slew of releases by established artists, and I love that they're keeping us on our toes with Steinvord and these alleged "new people". Any guesses as to who they might be? 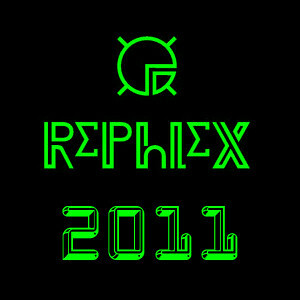 I look forward to following Rephlex in the coming year as it is shaping up to be a great one. Read the full Spannered interview HERE. "Dwayne Omarr Multi Funk (classic usa electro fusion suavity) available March 14, rephlex cat 202cd. The Criminal Minds TCM (original britcore hip hop) available 21st March, rephlex cat 208 cd/lp. next up, Zwischenwelt 'Paranormal Aktivitat' and Dave Monolith 'Welcome'."